For those of you who have little white dogs or yorkies with smelly eye drainage,this product is a must. Many people wonder why some dogs eyes water, which causes a stain on the fur just below their eyes. This condition is called epiphora. When the facial hair is wet from excess tearing it is the breeding ground for bacteria and yeast. Not only is it unsightly but may be very irritating to your pet. The staining may also emit a moderate to noticeably strong odor. Up until now these reddish brown stains due to tear pigments were hard to eliminate completely. 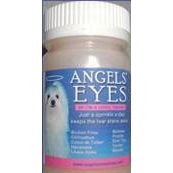 Use ANGELS' EYE�S Daily: It is 100% safe for daily use and guaranteed to clear the tearing better than any other product on the market. Just sprinkle Angel Eyes daily on regular food wet or dry. For optimal results Angels' Eyes must be used DAILY for 3 months. After 3 months, reduce it to 4 times a week. After 6 months, reduce it further to twice a week. As you keep trimming the stained areas, the newly grown coat will be totally clear.